Thanks to a group of engineers at Case Western Reserve University in Cleveland, there is now: a magnetic resonance imaging machine that plays soothing music. And we don’t mean music piped into the MRI suite to distract patients from the notoriously noisy exam. The music is actually being played through the gradient coils of the MRI scanner. We covered the inner working of MRI scanners before and discussed why they’re so darn noisy. The noise basically amounts to Lorenz forces mechanically vibrating the gradient coils in the audio frequency range as the machine shapes the powerful magnetic field around the patient’s body. To turn these ear-hammering noises into music, the researchers converted an MP3 of [Yo Yo Ma] playing [Bach]’s “Cello Suite No. 1” into encoding data for the gradient coils. A low-pass filter keeps anything past 4 kHz from getting to the gradient coils, but that works fine for the cello. The video below shows the remarkable fidelity that the coils are capable of reproducing, but the most amazing fact is that the musical modification actually produces diagnostically useful scans. Our tastes don’t generally run to classical music, but having suffered through more than one head-banging scan, a half-hour of cello music would be a more than welcome change. Here’s hoping the technique gets further refined. We can say one thing for [bitluni]: the BOMs for his projects, like this ESP32 AM radio transmitter, are always on the low side. That’s because he leverages software to do jobs traditionally accomplished with hardware, always with instructive results. If you’re looking for a little more range for your low power transmitter and you’re a licensed amateur operator, you might want to explore the world of QRP radio. AM, or amplitude modulation, was the earliest way of sending voice over radio waves. That makes sense because it is easy to modulate a signal and easy to demodulate it, as well. A carbon microphone is sufficient to crudely modulate an AM signal and diode — even a piece of natural crystal — will suffice to demodulate it. Outside of broadcast radio, most AM users migrated to single side band or SSB. On an AM receiver that sounds like Donald Duck, but with a little work, it will sound almost as good as AM, and in many cases better. If you want a better understanding of how SSB carries audio, have a look at [Radio Physics and Electronics] video on the subject. The video covers the math of what you probably already know: AM has a carrier and two identical side bands. SSB suppresses the carrier and one redundant side band. But the math behind it is elegant, although you probably ought to know some trigonometry. Don’t worry though. At the end of the video, there’s a practical demonstration that will help even if you are math challenged. Readers who were firmly on Team Nintendo in the early 2000’s or so can tell you that there was no accessory cooler for the Nintendo GameCube than the WaveBird. Previous attempts at wireless game controllers had generally either been sketchy third-party accessories or based around IR, and in both cases the end result was that the thing barely worked. The WaveBird on the other hand was not only an official product by Nintendo, but used 2.4 GHz to communicate with the system. Some concessions had to be made with the WaveBird; it lacked rumble, was a bit heavier than the stock controllers, and required a receiver “dongle”, but on the whole the WaveBird represented the shape of things to come for game controllers. Given the immense popularity of the WaveBird, [Sam Edwards] was somewhat surprised to find very little information on how the controller actually worked. Looking for a project he could use his HackRF on, [Sam] decided to see if he could figure out how his beloved WaveBird communicated with the GameCube. This moment of curiosity on his part spawned an awesome 8 part series of guides that show the step by step process he used to unlock the wireless protocol of this venerable controller. Even if you’ve never seen a GameCube or its somewhat pudgy wireless controller, you’re going to want to read though the incredible amount of information [Sam] has compiled in his GitHub repository for this project. Starting with defining what a signal is to begin with, [Sam] walks the reader though Fourier transforms, the different types of modulations, decoding packets, and making sense of error correction. In the end, [Sam] presents a final summation of the wireless protocol, as well as a simple Python tool that let’s the HackRF impersonate a WaveBird and send button presses and stick inputs to an unmodified GameCube. This amount of work is usually reserved for those looking to create their own controllers from the ground up, so we appreciate the effort [Sam] has gone through to come up with something that can be used on stock hardware. His research could have very interesting applications in the world of “tool-assisted speedruns” or even automating mindless stat-grinding. Mike Ossmann and Dominic Spill: IR, Pirates! Mike Ossmann and Dominic Spill have been at the forefront of the recent wave of software-defined radio (SDR) hacking. Mike is the hardware guy, and his radio designs helped bring Bluetooth and ISM-band to the masses. Dominic is the software guy who makes sure that all this gear is actually usable. 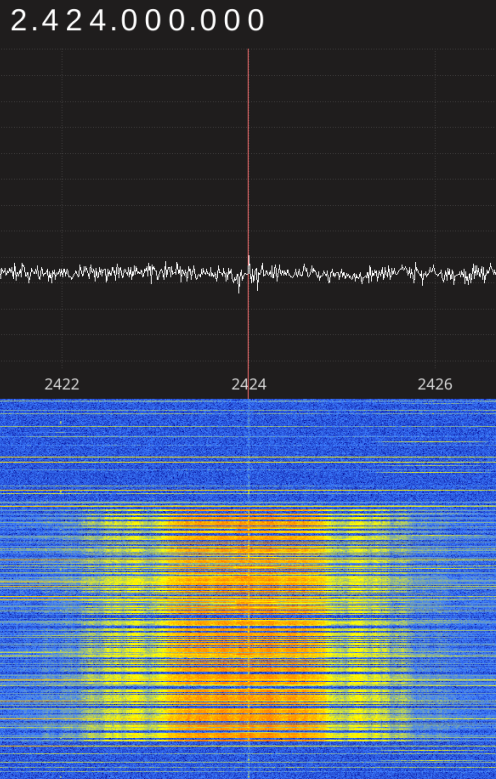 The HackRF SDR is still one of the best cheap choices if you need an SDR that can transmit and receive. So what are these two doing on stage giving a talk about IR communication? Can you really turn traffic lights green by blinking lights? And can you spoof a TV remote with a cardboard cutout, a bicycle wheel, and a sparkler? What does IR have to do with pirates, and why are these two dressed up as buccaneers? Watch our video interview and find out, or watch the full talk for all of the juicy details. If you like to read with gentle music playing, do yourself a favor and start the video while you’re reading about [Hugo Swift]’s MIDISWAY. The song is Promises, also by [SWIFT], which has piano phrases modulated during the actual playing, not in post-production. The MIDISWAY is a stage-worthy looking box to sit atop your keys and pulse a happy little LED. The pulsing corresponds to the amount of pitch bending being sent to your instrument over a MIDI DIN connector. This modulation is generated by an Arduino and meant to recreate the effect of analog recording devices like an off-center vinyl or a tape that wasn’t tracking perfectly. While recording fidelity keeps inching closer to perfect recreation, it takes an engineer like [Hugo Swift] to decide that a step backward is worth a few days of hacking. Now that you know what the MIDISWAY is supposed to do, listen closely at 2:24 in the video when the piano starts. The effect is subtle but hard to miss when you know what to listen for. MIDI projects abound at Hackaday like this MIDI → USB converter for getting MIDI out of your keyboard once you’ve modulated it with a MIDISWAY. Maybe you are more interested in a MIDI fighter for controlling your DAW. MIDI is a robust and time-tested protocol which started in the early 1980s and will be around for many more years. Low cost, long range, or low power — when it comes to wireless connectivity, historically you’ve only been able to pick two. But a group at the University of Washington appears to have made a breakthrough in backscatter communications that allows reliable data transfer over 2.8 kilometers using only microwatts, and for pennies apiece. For those unfamiliar with backscatter, it’s a very cool technology that modulates data onto RF energy incident from some local source, like an FM broadcast station or nearby WiFi router. Since the backscatter device doesn’t need to power local oscillators or other hungry components, it has negligible power requirements. Traditionally, though, that has given backscatter devices a range of a few hundred meters at most. The UW team, led by [Shyamnath Gollokota], describe a new backscatter technique (PDF link) that blows away previous records. By combining the spread-spectrum modulation of LoRa with the switched attenuation of incident RF energy that forms the basis for backscatter, the UW team was able to cover 2800 meters for under 10 microwatts. What’s more, with printable batteries or cheap button cells, the backscatter tags can be made for as little as 10 cents a piece. The possibilities for cheap agricultural sensors, ultracompact and low power wearable sensors, or even just deploy-and-forget IoT devices are endless. We’ve covered backscatter before, both for agricultural uses and for pirate broadcasting stations. Backscatter also has also seen more cloak and dagger duty. Starhawk has updated the project titled The Homebrew Steampunk Laptop v2.